There are many accommodation options near Halifax’s Stanfield International Airport, for travellers passing through at unusual hours. 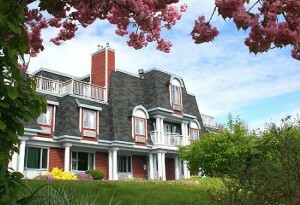 The Inn on the Lake is easily one of the most elegant options but it’s a few minutes away by car. If being close is your highest priority, then there are 3 hotels that practically sit on airport property. All of them offer free shuttle transport to and from the airport, free high-speed internet and swimming pools. Aside from the airport hotels, there are more atmospheric options, if you don’t mind a 10-minute drive and have your own transportation or can afford a taxi to the airport. For campers, Dollar Lake Provincial Park offers a sandy beach, hiking trails and quiet camping, just a stone’s throw from the airport.